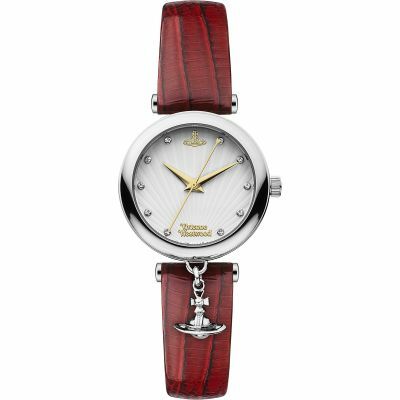 Vivienne Westwood Trafalgar VV108BKBK is an amazing and attractive Ladies watch. Case is made out of PVD Gold plated while the dial colour is Black. This model has got 30 metres water resistancy - it can be worn in scenarios where it is likely to be splashed but not immersed in water. It can be worn while washing your hands and will be fine in rain. We ship it with an original box and a guarantee from the manufacturer. Punk fashion designer Vivienne Westwood has been making waves in the fashion world since the 1970s. Today, the icon's collection continues to make a statement, and is complemented with a watch range that proudly celebrates the brand's cult roots. The collection includes wrist wear for men and women, with both elegant and understated pieces sitting alongside edgy and head-turning statement watches. 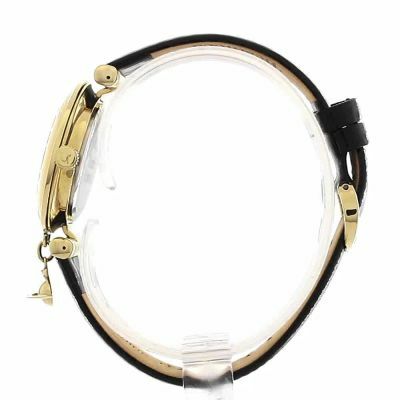 Women can choose from a range of metallic and leather straps in shades from deepest black to soft cream - and everything in between. The iconic orb charm adds a sentimental touch to the design, making these watches unmistakeably Vivienne Westwood. Men's timepieces feature bold, futuristic designs, alongside iconography synonymous with the classic punk rock movement. From dramatic, chunky cuffs to delicate and elegant watches, a Vivienne Westwood watch is a must for anyone who adores fashion's finest designers. Explore the full collection to find your favourite piece here. Watch Shop is an authorised Vivienne Westwood stockist. Sign up to receive email updates when new styles of Vivienne Westwood are added to Watch Shop!